A little over a week ago, the municipality of Yasuf received a notice from Israeli occupation forces that about 1.5 dunam of Yasuf land would be confiscated to expand the nearby Za’tara checkpoint. The notice was not provided in time for the municipality to appeal. A year ago, a settler had been killed at a bus stop near the junction. The occupiers had previously confiscated about 2 dunam of land, constructed a metal tower, and turned the area into a military zone. Earlier many dunams of land were taken from Yasuf village around the road to Jericho; recently, a metal barrier was built at nearby Marda. Illegal Israeli settlers, working with the occupation army, have already stolen much of Yasuf village’s fertile land for Tappuach and Ariel illegal settlements. Palestinian villagers are not allowed to tend to at least 2,000 dunams of their land and went to court 2 years ago to demand their rights. However, the judge advised them to take a different approach: instead of putting requests for permission to reach their land, he said farmers of Yasuf can demand the removal of the illegal Israeli colony of Tappuach altogether. The court case is still ongoing. In addition to Yasuf’s land confiscation for settlements, military zones and checkpoint expansion, Israeli settlers have caused many other problems for the village. They previously set on fire and defaced a mosque in Yasuf. Settler shepherds let their sheep and goats consume village crops and they break olive trees to feed branches to their sheep. They also come to the village with soldiers to arrest school children. In the last 4 months alone, the Israeli army have kidnapped and imprisoned 10 young people from the village. Settlers also frequently harass and throw stones at children. 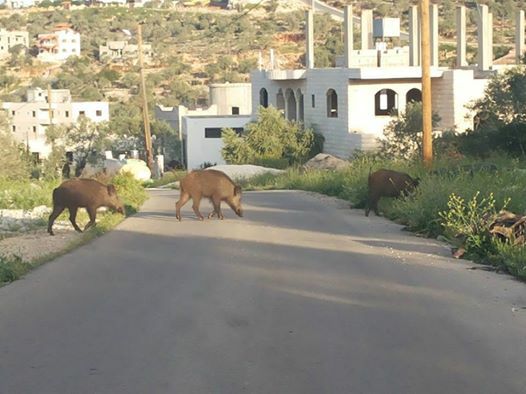 However, one of the biggest problems in Yasuf is wild pigs, which Israeli settlers dump in the village by the truckload. The pigs scare children, come into houses, and have attacked villagers. Pigs prevent villagers from growing any crops except in small fenced gardens. “You can’t plant anything – the pigs will eat it all, from figs to chickpeas,” a local farmer told IWPS. Villagers are not allowed to kill the pigs by Israel – they face fines and prison if they do. The Israeli motives, like those of the pigs, seem to be designed solely to destroy. 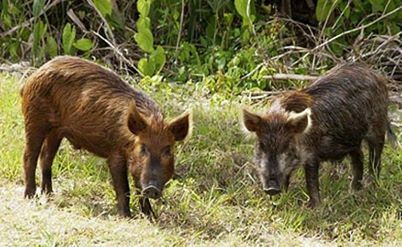 Wild pigs hanging out in the city of Salfeet, attacking people and destroying crops.